Technicians at General Electric weld together as many as 20 separate pieces of metal to achieve a shape that efficiently mixes fuel and air in a fuel injector. But for a new engine coming out next year, GE thinks it has a better way to make fuel injectors: by printing them. To do it, a laser traces out the shape of the injector’s cross-section on a bed of cobalt-chrome powder, fusing the powder into solid form to build up the injector one ultrathin layer at a time. This promises to be less expensive than traditional manufacturing methods, and it should lead to a lighter part—which is to say a better one. 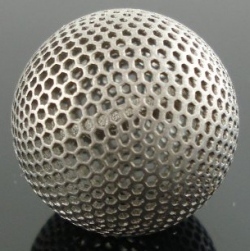 Unlike machining processes, which can leave up to 90 percent of the material on the floor, 3-D printing leaves virtually no waste—a huge consideration with expensive metals such as titanium. The technology could also reduce the need to store parts in inventory, because it’s just as easy to print another part—or an improved version of it—10 years after the first one was made.